Fancy a Tapaiccino? Check it out at Simply Tapai. TAPAI, a traditional recipe of fermented glutinous rice, takes on a new twist under the hands of an innovative entrepreneur. Suggest serving tapai with chocolate sauce or as a topping in an ice blended drink and high chances are your elderly makcik will think that you have completely lost your marbles. Slurp it up: Mazlina, flanked by her team members Fauzi (left) and Misfani, enjoying tapai at their cafe. But to Mazlina Mohammad, marrying the old and new is seen as a nouveau way of reintroducing this traditional fermented snack to the younger generation. Not only has the 31-year-old sole proprietor of Simply Tapai Enterprise come up with the likes of fruit and ice-cream toppings to go with the fermented glutinous rice, she also has a trademarked drink called Tapaiccino, which is ice blended Penang white coffee with tapai. Looking into the taste test of Mazlina’s ideas would inevitably yield comments ranging from ‘yucks’ to ‘yum’. This is hardly surprising as tapai, by itself, is an acquired taste. Colourful: Fruit toppings on tapai lend a contrast to the mushy texture. 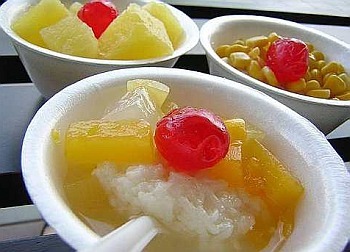 Those who have partaken of the sweet, tangy and yeasty flavoured dessert of glutinous rice will attest to it. “It’s like having your nose tweaked,” comments one diner in regard to the sharp sour notes. “The smell has the quality of regurgitated rice,” comments another of the yeasty whiff. But just as the pungent durian will have its following, the same is the case for tapai. And for the connoisseur, the seductive aroma and taste is likened to an awakening of the senses. Some diners have reported experiencing a slight floaty feel in the after-effects but this varies from one individual to another and one’s tolerance level to alcohol, a result of the fermentation process. With extra dressing, the effect is nothing short of spectacular! 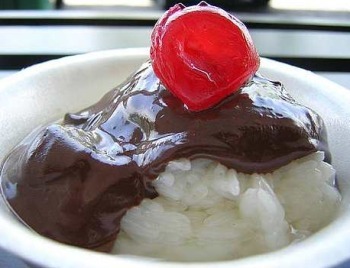 Interesting: Hot chocolate on tapai with a cherry on top makes a rich and fulfilling dessert. Forget about mundane toppings like fruit cocktail. Well, it is an option for those who like a fresh, crunchy feel to contrast the mushy texture of the fermented pulut. But from a personal opinion, hot chocolate topping on tapai is an indescribable luxury which justly gives reason to the term ‘sinful temptation’. As for ice blended drinks with tapai toppings, this is something a young palate may appreciate. The grainy feel of the fermented rice answers to the ‘snack and drink’ combo which was made popular by the bubble tea concept some time ago. The Tappaiccino will definitely agree with coffee lovers and for those who are not partial to exposing their taste buds to new sensations, the berry flavoured blend with tamarind answers to this call. Now note that while tapai may have very strong characteristics on its own, these traits invariably take a back seat in the blended drinks. The same also happens when it is served with toppings like ice-cream, chocolate or fruit. Everything becomes sweet and in these instances tracing the piquant character that is associated with tapai practically takes some effort. According the Mazlina, these nouveau ways of serving tapai is her way of educating the public on the alternative ways to enjoy this traditional dish. Still, in order to gain universal acceptance, this young entrepreneur who comes from a family of padi planters in Alor Star, Kedah, says that quality control must come from the base product itself. When she started Simply Tapai last year with her own funds, she and her team took 11 months to tweak their tapai into the required taste before releasing the product into the market. “We were aiming for the ‘universal taste’, a broad base appeal. As you know, the making of tapai is full of taboos. “In the olden days, the makers had to refrain from talking as it was believed that it would make the tapai sour. “There is truth to this as saliva droplets contain bacteria which will contaminate the tapai. One of the telltale indicators of contaminated tapai is its sour taste. A good tapai will be sweet. “To achieve this, we have to practise strict hygiene standards and employ methods such as precision cooking so that there will be no change in taste in all the batches,” explains Mazlina of this ‘sensitive’ product. As most homemakers of the yesteryear will agree, tapai making is mostly a hit-and-miss affair with no surety that the end product will turn out to the cook’s expectations. Even a slight change in weather will leave an effect on a jar of fermenting tapai. But where Mazlina is concerned, she is confident that she has found a niche market by mass producing this traditional favourite. And though this is her first entrepreneurial venture, Mazlina intends to leave her mark in the food industry. “Of course there have been downtimes and obstacles but I have never felt unsure of myself. No doubt, this is what I want to do. Giving up is not an option as this is one reason why most businesses fail,” concludes this tapai maker. For those interested in selling Mazlina’s tapai, call 012-425 6558 or visit the factory at 6, Jalan Bukit Jati 5, Taman Bukit Jati, Klang, Selangor.